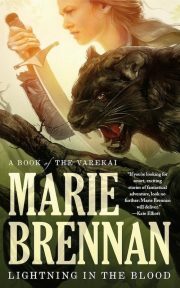 2017’s Lightning in the Blood is the second in Marie Brennan’s Books of the Varekai series. At the end of Cold-Forged Flame, Ree set out to help her new friend Aadet overthrow the tyrant of Solaine. With the tyrant deposed and rightful heir Enkettsivaane in power, that leaves the question of what to do with Ree, who is an archon, a being of great power. A useful ally, yes, but a dangerous next-door neighbour. Every archon must follow its nature. Providentially for Enkettsivaane, Ree’s nature provides a solution that will keep his hands clean. 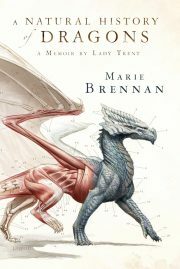 Ree’s wanderlust compels her towards Solaine’s border, towards new lands and new adventures. She very nearly makes it out of Solaine. 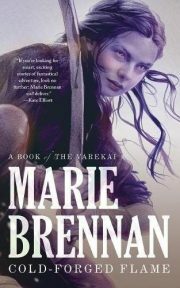 2016’s Cold-Forged Flame is the first story in Marie Brennan’s Varekai series. Called up out of shadows, without memory or even a remembered name, the swordswoman is magically bound to carry out a quest using methods that are unclear, for a purpose that is not explained. All she knows is that she must somehow collect blood from the cauldron of the Lhian. Whoever or whatever the Lhian might be. One final detail she learns: most of the people who try to win a prize from the Lhian never return.